Cameron is a kid of few words and rarely makes any requests for dinner. 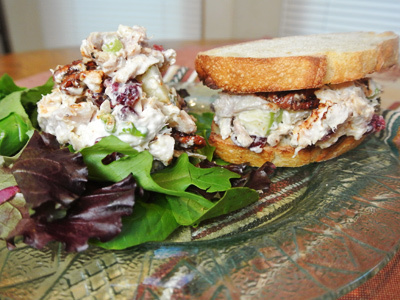 Recently he was out to eat and ordered a chicken salad wrap that he described as having big chunks of apples with dried cranberries, kind of sweet with lots of dressing. He asked if I could make it sometime and I told him I’d give it a try. Not having tasted it myself, I was left to translate his description into a recipe that would live up to his expectations. I searched several blogs to find a dressing that would go with what I had planned. The one that stood out was a slightly sweet dressing with a hint of citrus from “Cookbook Junkies“. My contribution was adding some sweet and spicy pecans to tempt the taste buds and give a little added crunch. I had a crusty artisan sourdough loaf that I sliced and toasted for sandwiches and also picked up some spring greens for a salad. We all thought it tasted pretty amazing and was a success according to Cam which I guess is really all that matters! It hit me this week how soon the holidays will be here. Time has quickly gotten away from me and I’ve had to rush around trying to get things done. With that in mind I haven’t had a lot of time to make dinner. When I’m crunched for time I sometimes pick up a rotisserie chicken which saves me the trouble and usually makes more than one meal. 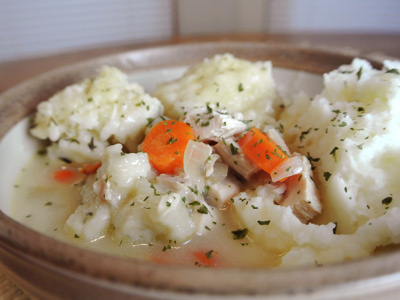 I picked off the leftovers and chopped it to make my tried and true recipe of chicken and dumplings that everyone loves. With the cold weather we’ve been having it sounded like the perfect time for a comforting bowl of stew with a dollop of mashed potatoes on the side. It’s like immersing the potatoes into a dumpling gravy that tastes oh so good. Stay warm everyone and have a great weekend! It looks like we may have a cold blustery weekend with dropping temperatures and the possibility of rain or snow. I thought it would be the perfect time to hunker down by the fire with a good book and a warm bowl of soup. You see, I’m not a cold weathered person and the least bit of cold seems to go right through me. I’ve always been this way, once the cold settles into my bones it’s there for the duration and I don’t thaw out until Spring. Something hearty . . . something rich would be just the thing to warm my spirits. 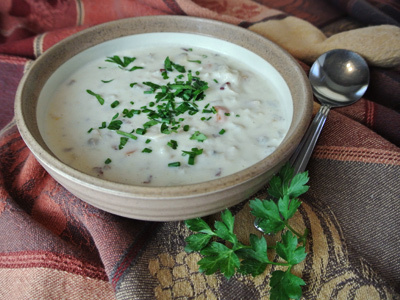 With that in mind I reached for my recipe for chicken and wild rice soup which is filling as well as comforting. One bowl and it may be time for a nap!